Primary Natural Resources coal, iron ore, petroleum, natural gas. 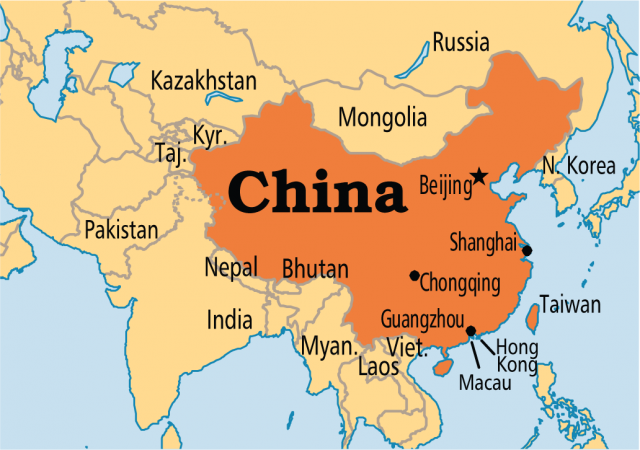 CHINA IS ONE of the largest countries in the world, with more than 3.6 million square mi (9.6 million square km) of land stretching from the PACIFIC OCEAN in the east to the towering glacial summits of the HIMALAYAS and Karakorum mountains in the west. From north to south, this Asian giant covers more than 30 degrees of latitude, extending from the edge of Siberia southward into the tropics near VIETNAM. Traveling from east to west, the land rises in a series of steps from the coastal zone of the North China Plain to the top of the world on the TIBETAN PLATEAU. The country’s terrain is diverse, with vast deserts, stands of forest, numerous mountain ranges, major river basins, high plateaus, extensive GRASSLANDS, and rich plains. On and below the surface, the land has extensive reserves of natural resources that provide the nation with enormous potential wealth. China ranks first in the world in population (1.3 billion), equal to 22 percent of the world’s total. The population is as varied as the landscape. The Han are the most numerous of the 56 recognized nationalities, accounting for 92 percent of all Chinese. China has borders with North KOREA to the east; MONGOLIA to the north; RUSSIA to the northeast; KAZAKHSTAN, KYRGYZSTAN, and TAJIKISTAN to the northwest; AFGHANISTAN, PAKISTAN, INDIA, NEPAL, Sikkim and BHUTAN to the west and southwest; and Vietnam, LAOS and MYANMAR to the south. Across the seas to the east and southeast are South KOREA, JAPAN, the PHILIPPINES, BRUNEI, MALAYSIA, and INDONESIA. Politically, the country is organized as a republic and divided into 21 provinces, 5 autonomous regions, and 4 special municipal districts. The president serves as the head of state, the Communist Party, and the army, with a prime minister supporting as the head of government. In addition to the president and prime minister, leadership is managed through the People’s Congress, which provides popular representation, and a Communist Party Standing Committee, which provides direction and leadership. China now has 668 cities, of which 13 have populations of more than 2 million and 24 between 1 and 2 million. SHANGHAI is the largest city by urban population with 14.7 million at the end of 2003. The other major cities are BEIJING, Tianjin, Chongqing, Xi’an, Wuhan, Guangzhou, HONG KONG, Chengdu, Shenyang, and Shenzen. China’s topography started forming millions of years ago as the Indian landmass (plate) pushed northward into Eurasia, raising the landscape higher and higher and forming the Qinghai-TIBETAN PLATEAU. Often called the roof of the world, this plateau averages more than 9,840 ft (3,000 m) above sea level and includes most of the world’s highest mountains. As a result, China’s terrain descends in a series of steps from west to east. The second step includes the gently sloping Inner Mongolia Plateau, the Loess Plateau, the Yunnan-Guizhou Plateau, the TARIM BASIN, the Junggar Basin and the Sichuan Basin, with an average elevation of between 3,000 and 6,000 ft (1,000 and 2,000 m). The third step, dropping to 1,500 to 3,000 ft (500 to 1,000 m) in elevation, extends eastward from the Greater Hinggan, Taihang, Wushan, and Xuefeng mountain ranges to the coast of the Pacific Ocean. Throughout this zone are China’s major agricultural plains, the Northeast Plain, the North China Plain, and the Middle-Lower Changjiang Plain. Mountains represent a major feature of China’s physical geography, with mountains and associated plateaus and hills accounting for about 65 percent of the country’s landmass. Within this mountainous setting are 90 percent of China’s forests, 77 percent of its pastures, 76 percent of its lakes, and 98 percent of its hydropower resources. With a mountainous topography, distinct vertical zonation, and a monsoon-oriented weather regimen, it is no wonder that China has over 1,500 rivers. Most of the major rivers have their source on the Qinghai-Tibet Plateau and drop rather dramatically during the first third of their course. China’s many rivers can be categorized as exterior and interior systems. The catchment (drainage) area for the exterior rivers accounts for 64 percent of the country’s total land area. The Yarlung Zangbo River in Tibet, which ultimately empties into the INDIAN OCEAN, boasts the largest canyon in the world, the Yarlung Zangbo Grand Canyon at 131 mi (504 km) long and 19,700 ft (6,009 m) deep. The catchment area for the interior rivers that flow into inland lakes or disappear into deserts or salt marshes makes up about 36 percent of China’s total land area. China’s longest inland river, the Tarim (1,300 mi or 2,179 km), flows from west to east across the northern edge of China’s greatest desert, the Taklamakan, before disappearing into the sands near Lop Nor, a large inland lake that looks a lot like a human ear if you see it from space. With headwaters high in the Tibetan Plateau, the CHANGJIANG (Yangzi) at 3,900 mi (6,300 km) is the longest river in China and in all of Asia. It is also the third-longest river in the world, next only to the NILE in Africa and the AMAZON in South America in length. With a catchment basin of more than 700,000 square mi (1.8 million square km), its BASIN is more than twice as large as that of the HUANG (Yellow River). Also known as the “golden waterway” in its upper reaches, the Changjiang serves as an important trade and transportation route from Sichuan Province to the sea. The second longest river in China is the HUANG (Yellow) River with a length of 5,464 km (3394 mi). The Yellow River valley was one of the birthplaces of ancient Chinese civilization. It has lush pasturelands along its banks, flourishing agriculture and abundant mineral deposits. The Heilongjiang is the largest river in north China, of which 1,925mi (3,101 km) are in China. The Pearl River (Zhujiang), 1,376 mi or 2,214 km long, is a major river in south China. In addition, China has the most famous man-made river in the world—the GRAND CANAL, which runs from Hangzhou in Zhejiang Province in the south to Beijing in the north. Work on the Grand Canal began as early as the 5th century, but many of its most important extensions (to Beijing) occurred under the Mongols of the Yuan Dynasty. The canal links five major rivers: the Haihe, Huang, Huaihe, Changjiang and Qiantang, and with a total length of 1,100 mi (1,801 km), is the longest and oldest man-made waterway in the world. China has 507,000 square mi (1.3 million square km) of cultivated lands (about 9 percent of the world’s total), distributed primarily in the Northeast Plain, the North China Plain, the Middle-Lower Changjiang Plain, the Pearl River Delta, and the Sichuan Basin. The fertile soils of the Northeast Plain, the largest plain in China, have a dark black color and used to produce wheat, corn, sorghum, soybeans, flax, and sugar beets. The brown soils of the North China Plain just to the south are planted with wheat, corn, millet, and cotton. The terrain of the Middle-Lower Changjiang Plain is noticeably flat and particularly suited to paddy rice. Because the area’s abundant lakes and rivers are used extensively in freshwater fish farming, this part of China has the distinction of being called the “land of fish and rice.” The area also produces large quantities of tea and silkworms, both key factors throughout China’s long economic history. The soils in the Sichuan Basin, an ancient dried-up lakebed in the upper Changjiang Basin, have a reddish tint that has given rise to the basin’s other name, the Red Basin. Because the climate of the basin is warm and humid, this “land of plenty” is green with crops in all four seasons, including paddy rice, rapeseed, and sugarcane. The Pearl River Delta along the southeast coast near Hong Kong abounds with paddy rice, gathered two to three times every year. Forests cover approximately 621,000 square mi (1.6 million square km) of China, spread throughout the mountain ranges of the northeast and in southwest China, particularly Yunnan Province. Because Yunnan is crossed by the TROPIC OF CANCER along its southern edge, it is often called the “kingdom of plants,” especially at Xishuangbanna in the very southwest corner, where a rare tropical broadleaf forest plays host to more than 5,000 plant species. Grasslands in China cover an area of 1.6 million square mi (4 million square km), stretching from the northeast to the southwest. They are the centers of animal husbandry. The Inner Mongolian Prairie is China’s largest natural pastureland, and home to the famous Sanhe horses, Sanhe cattle, and Mongolian sheep. The important natural pasturelands north and south of the TIAN SHAN MOUNTAINS in XINJIANG are ideal for stock-breeding. China is rich in mineral resources, and all of the world’s known minerals can be found here. To date, geologists have confirmed reserves of 158 different minerals. These include 10 energy-related minerals, including oil, natural gas, coal, and uranium; 54 metallic minerals, including iron, manganese, copper, aluminum, lead and zinc; and 91 nonmetallic minerals. One of the easiest distinctions to make is that between Outer China and Inner China. Surrounding China on the north and west is a series of lands that have for centuries been “beyond” the Wall (Great Wall). Lands where water and rainfall are scarce and animal husbandry takes precedence over crops. Lands where the soils are rocky and sandy, where altitude keeps the earth frozen for much of the year, and where treeless plains stretch beyond the imagination. It is also a land that drains to the interior of the continent and not to the sea. These lands beyond the Wall are extremely remote and generally inhospitable. Where human habitation has taken hold, in those areas where the soils are more protected and water is sufficient for some form of agriculture, the peoples tend to be non-Chinese with traditions and connections to history and geography far removed from those of China’s core peoples. Because this landscape provides so little (if anything at all) in the way of natural support for the traveler or an invader, it has always served as a natural buffer between China proper and the outside world and a way for the Chinese to choose where and when they meet the outside world. For this reason, the area has typically been poorly connected with the rest of the country, a historical design that has proven to be a major obstacle to development as China begins the 21st century. Outer China consists of much more than just Tibet, the first area that most foreigners recognize or think of as being outside of China proper. The area also includes the Inner Mongolian and Xinjiang Autonomous Regions, plus Qinghai Province. Gansu Province and the Ningxia Autonomous Region could also be included. It is a vast area, covering some 2 million square mi (5 million square km), slightly more than 53 percent of the country’s total land area. That means that if you just considered Outer China alone, it would be the seventh-largest country in the world, an area 10 times that of FRANCE. Within this landscape are some 50 million people, a number that is large by any standard other than China, where it represents only 4 percent of the population. This empty landscape is empty for a reason; The land just cannot support large numbers of people. And where it can support life, it does so best with grazing animals and animal husbandry. Inner Mongolia (23 million people) and Xinjiang (19 million people) are clearly the most prosperous of the region’s four-plus administrative divisions, with most of the limited arable land. But the prosperity associated with these pockets of development is far from uniform. In spite of the fact that we have chosen to group these lands together under one heading, they are so distinctive individually that it is valuable to give each a little extra attention before moving on. The Inner Mongolian Autonomous Region (one of five such regions in China) is part of the great Mongolian Steppe (lands of Genghis Khan and the Mongol horde), a plateau region that averages about 3,280 ft (1000 m) above sea level and extends from China’s border with Russia in the northeast to the deserts of Xinjiang in the northwest. Most of the land is covered to some degree by grass, although there are areas of woodland and forest in the extreme northeast, an incredible wetland region (Edsin Gol) with millions of birds and horses in the middle, and two significant deserts, the Ordos and the GOBI. But the grasses are not guaranteed, having come and gone with changes in climate over the centuries, and making a living off of the land in any one location is less than certain. It is only under the more recent Chinese occupation that cities have even existed, being of little use to the nomadic Mongols, who saw the entirety of the Earth as common ground for their herds. Today, the region’s landscape reflects far more of what has come to be seen as a modern view of development. The area’s capital is in Huhhot, a thriving university and manufacturing center just seven hours or so to the west of Beijing. Baotou, just a little further to the west and near the big bend in the Huang River, serves as one of China’s major industrial centers for steel and coal production. Although most of the area’s residents live in more modern apartment-style housing, it remains common to see Mongol-style circular white tents (gers) across the landscape as you move away from the village and town region along the region’s southern border with the Great Wall. Of the area’s 23 million residents, 84 percent are Han Chinese, a majority of whom live in the few agricultural zones near the Great Wall or in one of the manufacturing or mining centers. The remaining 16 percent of the population is mostly Mongolians, making the region one of only seven administrative divisions in China where the Han concentration is less than 90 percent. Moving west from Inner Mongolia, the land gets higher and drier, and the ground has more rocks as we enter the Gobi (literally “rocky desert”) until we come to Xinjiang, another of China’s autonomous regions. Xingjiang is quite large, roughly three times the size of France but with only 19 million people. Like Inner Mongolia, most of the population lives in a few major cities and around the oases near the Tarim River. The largest city is the region’s capital Urümqi. Another major city, Kashi (old Kashgar), at the far western end of the basin, served as China’s front door along the SILK ROAD for more than 2,000 years. It is also the most distant place on Earth from any ocean. If you were to look down from space, you would see Xinjiang as a group of great desert basins (the Tarim and Dzungar), a smaller basin with the lowest point in China (the Turfan Depression at -505 ft or -154 m), and a towering chain of mountains (the Tian Shan or “Heavenly Mountains”) running through the middle. But overall, your impression would be best described using words like dry, barren, rocky, and sandy. Because the area contains several basins, there is some water, but most of it disappears into the sands. The population of Xinjiang has many Turkishspeaking Muslim people similar in culture and language to their counterparts in nearby Soviet Central Asia. The Uigurs (7.2 million) are the most numerous of these groups, and can be found throughout the productive oases. There are also important numbers of Kazakhs in northeastern Xinjiang, and the Kirghiz, who occupy the high mountain pastures of the southwest near Afghanistan. In the last 20 years, major coal, oil and gas discoveries have been made, but the lack of effective modern infrastructure and lack of transportation connectivity with China’s eastern seaboard has made extensive exploitation less than ideal. There are also significant deposits of minerals, especially gold, but as with oil and gas, no serviceable market nor infrastructure to support exploitation. There was a major cotton industry in Xinjiang, but the recent drop in world market prices has caused the government to institute a plan reducing production by 25 percent each year for the next several years. In addition to the railroad from Urumchi to Lanzhou in northwest China, new roads have been constructed along historic caravan routes, connecting the regional capital of Urumchi with the oil field at Karamai, the ancient town of Kashgar (Kashi), and towns near the Soviet border. Say “Tibet” and a million different images come to mind. If Xinjiang is famous for its deserts, long forgotten desert cities, and tales of singing maidens hiding in desert sands, Tibet is mysterious as the land beyond the snow, the roof of the world, and more recently thanks to Hollywood, the idea of Shangri-la, that perfect peaceful place where people live forever and there are no wars or conflicts. This incredibly high, frigid landscape is among the world’s most inhospitable places. The land called Tibet (Xizang to the Chinese) is part of a great plateau pushed up as the Indian subcontinent moved into the Central Asian land mass. It is a remarkable highland region that is almost everywhere above 9,840 ft (3,000 m). While the land has wide undulating platforms, numerous snow-capped mountains, glaciers that drain into dozens of long deep valleys, and hundreds of small salt lakes, we as outsiders associate far more with the region’s borders that ring with the names of the world’s most famous mountain ranges; the Himalayas with the highest mountain on Earth, Mt. Everest (Qomolangma) at 29,028 ft (8,848 m), and the Karakorams, home of the second-tallest mountain, K2, at 28,250 ft (8,611 m). On the southern and northeastern periphery, several of the world’s great rivers (Mekong, Changjiang, Huang, Indus, IRRAWADDI, Salween, and Bramaputra) find their sources. But aside from all this geographic wonder including Mt. Everest, it is generally Lhasa, Buddhism, and the Dalai Lama that give outsiders a geographic hold on the landscape. These highland peoples have historically been yak herders and nomads, with marginal farming limited to the broader valleys such as the one at Lhasa, where concentrations of people give the area a sense of place. Buddhist monasteries have been at the center of society here for more than 2,000 years, organized by a landowning theocracy dominated by monks. Following contact with the Mongols, the theocracy came to be headed by a Dalai Lama, with the incredible Potala Palace in Lhasa as headquarters. So significant has been the role of religion in Tibet that until the 1950s, one out of every five Tibetans was a Buddhist nun or monk. Since the early 1950s, the Chinese government has encouraged in-migration by farmers and others, both to stimulate agricultural production and economic development and increase Han presence. But the region’s remoteness and lack of connectivity to other areas in China has greatly limited most of these development efforts. At present, a major railroad line is being built across the frozen Tibetan wastes to Qinghai, where it will connect with the main east-west line to Lanzhou and then eastern China. Located in extreme southwest China, the provinces of Yunnan and Guizhou could easily be considered part of Outer China, for the area is remote, disconnected from China’s core, and populated by minority peoples. But the geography is such that it is a special region unto itself, with major dissimilarities in the core conditions that make it such a unique and interesting place. Just for a reference, you can generally consider the southwest as being south of the Changjiang, with borders with Myanmar, Laos, and Vietnam to the east and south. Conceptually, the area could be grouped with Outer China in the sense that the high, rugged terrain of the Yunnan-Guizhou Plateau, with its rushing rivers, steep slopes, and lack of connectivity, served as a formidable barrier to entry into China’s interior lands. But the region has a long growing season, adequate rainfall for agriculture to exist where the soils are favorable, dense forestlands, and since 1949 improved road and rail connections with the rest of China. The region also grows rice, something we do not see in the dry climate regions that make up the traditional nomadic-pastoral landscape of the four areas in Outer China. Scattered throughout the plateau are numerous small plains and valleys, called batze by the locals, where many of the minority populations live and where agriculture is productive enough to support the 81 million people who now call the area home. But the area’s basic remoteness form China’s core, mild climate, good rainfall, and adequate food have given the people a laid-back attitude in stark contrast to many of China’s other regions, where the pressures of excessive population and inconsistency in food production have made life more problematic until recently. What is interesting about the southwest is that it is the physical geography that stands out without a dominant place or places around which we could typify the region with a label. And while there are plenty of cities to visit today, they tend to be lost in a landscape whose scenery is rich in picturesque limestone hills with precipitous slopes and overhanging cliffs, beautiful spired columns, giant sinkholes, and caverns with large subterranean rivers often crashing their way through unbelievable rock formations. In the extreme south where the TROPIC OF CANCER cuts through the southern edge of the plateau, the area boasts tropical forests, banana plantations, elephants, and a host of other jungle creatures unique to all of China. In contrast, you can move to the far northwest and the clouds and mist hide towering 20,000-ft-(6,000-m)-plus glacial mountains and hidden green valleys straight out of the Shangri-la in James Hilton’s The Lost Horizon. Both Yunnan and Guizhou have rich minority cultures that make up roughly 35 percent of the population. Of the 43 million people in Yunnan (15 million of whom live in five cities), the Bai, Hani, and Dai are the most numerous, while among Guizhou’s 38 million people (with 16 million in four cities), the Miao are the most prevalent. Yunnan is the most distinctive of China’s provinces in that it is home to 20 of the 55 recognized ethnic minorities, something you feel immediately when there. As with the other outer regions, the Han population in the southwest is far less than the 92 percent they average for the country as a whole. Despite the region’s relatively poor soils, important quantities of corn, sweet potatoes, and barley are also produced in the interior valleys and plains. The area is also becoming known as the tobacco capital of China, thanks to the large quantities of tobacco now grown throughout the plateau’s interior hill country and a host of new cigarette manufacturing facilities. Kunming, the capital of Yunnan, is a remarkably cosmopolitan city of 4.5 million, while Guiyang, with 3.4 million people, is the administrative center of Guizhou. Both were extremely important centers during the Japanese occupation of China in the late 1930s and early 1940s, and both have had significant contact with Westerners over the years. Kunming, in addition to being an important center along the old Burma Road, even served as a base for American flyers (the Flying Tigers) transporting goods during World War II. Aside from agriculture and tobacco, the region has extensive deposits of tin, followed by copper, zinc, and phosphorous. Located in the northeastern corner of China, between the Great Wall and the Russian and Korean borders, are three more provinces whose character has had a long history with China, particularly under Kublai Khan’s Yuan Dynasty. China’s northeast, or old Manchuria, consists of three provinces, Heilongjiang, Jilin, and Liaoning. Unlike the other lands to the west that are also beyond the Great Wall, the region was subject to Chinese expansion as far back as the 3rd century B.C.E., an expression of the agricultural potential of the Northeast (Manchurian) Plain that occupies the heart of the region. Today, the region is the most important heavy industrial center in China. It is also one of the more important centers for industrial crops such as soybeans, sugar beets, peanuts, and potatoes in addition to commercial grains such as wheat, corn, and millet. There are significant quantities of coal. Commercial quantities of iron ore exist, but most of it is low to mid-grade. The region also has sizable reserves of molybdenum, copper, lead, zinc, graphite, and bauxite. As China’s middle class continues to grow, so has the demand for recreation facilities and resorts. The heavily forested Hingan Mountains to the west also provide major quantities of timber products in addition to serving as recreational hunting and fishing areas. Because the mountains in the northeast receive significant amounts of snow, the area is also becoming the skiing center of China, with major resorts opening in the mountain areas near Harbin and Jilin. With a combined population of 105 million, the northeast accounts for a little more than 8 percent of China’s population, 8 percent of the total land, and interestingly, an 8 percent minority population. But the minority concentrations get smaller each year with continued inmigration by the dominant Han. The North China Plain holds a fascinating presence within the Chinese landscape. It is a special place where history and geography have truly worked together in shaping both the region and the nation as a whole. It is also very clearly a region where the history has also shaped the land. Yes, the region is rich agriculturally, particularly in the central portions where the flat delta plain of the Huang (Yellow) River has provided a broad well-watered setting on which to grow crops for millennia. The landscape is also old in terms of human contact, with archaeological findings such as Peking Man indicating that humans have been in the area for more than 500,000 years. The area is also old intellectually; great philosophers such as Confucius and Mencius expounded their theories on good government here some 2,700 years ago. But of the many geographic features worth describing, none seem equal in dominance to that of Beijing, the region’s major city and the nation’s capital. It is Beijing and its geography that have so defined what we see today; maybe even for China as a whole. With a resident population of 11.6 million, Beijing is the center of political power in China. To the casual observer, Beijing could easily be mistaken as another typically cosmopolitan world capital. But the city has had a long relationship with the sea, thanks to the Grand Canal, another of those Mongol creations whose lasting impact is beyond description. Beijing works closely with the neighboring port city of Tianjin (9 million) less that 100 mi (160 km) away. Although they are separate entities, they should not be be considered alone. With a combined population of more than 20 million, independence as national municipal districts, the support of the central government, historic connections to the outside world, and strong connectivity through roads, railroads, and water canals, these two northern giants represent a major driving force within the Chinese landscape and the world. With Beijing serving as host city for the 2008 Olympics, intense efforts are under way to extend both the city and region’s base as the premier economic center in China. The North China Plain is also home to many of China’s most recognizable cultural attractions. Among these, the Great Wall at Badaling, the Forbidden City, the Temple of Heaven, and the Summer Palace are World Cultural Centers. While many foreigners might think Shandong Province is best known for Tsingtao beer, the area contains the home of Confucius and Mount Tai, one of the five sacred mountains in China. To the south in Henan Province are the old capitals of Luoyang and Kaifeng along the banks of the Huang, as well as the mountain stronghold home of the Shaolin monks whose mysterious martial-art form, Wushu (Kengfu), has been turned into countless box office action dramas. Today, the administrative regions within the North China Plain contain only 5 percent of China’s land but have 22 percent of the population. This rather lopsided ratio is possible because the region also has 35 percent of the nation’s cultivated land. After centuries of silt deposition from the Huang, the region is covered with a dense carpet of agricultural fields. Although the climate is too cold for rice, the fertile soils are planted with crops such as winter wheat, barley, millet, and sorghum (kaoliang). For more than 80 centuries, Chinese farmers have lived and worked on lands of the Loess Plateau. During this time the untold battles and conflicts that occurred shaped a different kind of China. Located in northcentral China, the region was the heart of China’s first unification as an empire and in some ways a cradle for the great agricultural civilization that followed. Near the outland wastes of the deserts of the far west and the stony steppe of the Mongolian Plateau to the north, this landscape served for more than 10 centuries as China’s frontier fortress against foreign aggression. It is in this capacity as a stronghold against aggression that allows it to be described as a cradle (protector) of China’s agricultural civilization. It is also in this capacity and during this specific time that the coevolution of the physical and human Chinese landscapes began. For much of this geographic interplay, few geographic factors stand out more than the area’s isolated setting (at the time) and distance from the agricultural core. But its distance from the heartland and the poor agricultural conditions offered by the Loess Plateau soils were constant challenges to emperors needing to feed an army sufficient to defend the realm. While the LOESS is rich in calcium and thus fertile, the overall aridity of the region coupled with the fact that loess does not hold water makes traditional methods of irrigation and farming useless. As a result, much of the area has been heavily dissected into “badlands,” with rugged hills and gullies standing out in the landscape, a solemn testament to centuries of repeated misuse and overuse, particularly where there has been extensive cultivation (including terracing) and overgrazing on sloped terrain. The result was that the early Chinese dynasties had to rely on the agricultural heartlands to provide food. It is this extreme cost in food resources that constantly taxed the Chinese system and lead to years of internal strife and the possibility of revolt. Today, the region includes the provinces of Shanxi and Shanxi and maybe even parts of Gansu and Ningxia, but thinking of it as Xi’an and the big loop of the Yellow River is not far wrong. Despite the challenging environment, the region’s 70 million people are evenly distributed, following nearly 50 centuries of occupation. The land remains poor agriculturally, and farmers seldom expect to harvest more than two crops every three years. There are still thousands of people living in underground houses dug out of the ground, something the region is particularly famous for. Think of middle China and the first thing that probably comes to mind is the Changjiang, the Three Gorges Dam, and maybe by Shanghai and spicy Sichuan food. The words are a perfect beginning to understanding the heart of China. The Changjiang is China’s greatest river. Like the Huang, the headwaters of the Changjiang are high in the Tibetan Plateau. But with a catchment basin of more than 700,000 square mi (1.8 million square km), it is more than twice as large as the Huang Basin. Because the Changjiang flows south of the Qinling Mountains, its basin is completely different from that of the Huang. While the waters of the Huang descend through deserts, loess, and a landscape of prairie grass devoid of trees and other vegetation, the Changjiang makes it way through a series of basins in what was formerly a region of dense tropical and subtropical forest. Because the region has been agriculturally rich for nearly 2,000 years (with triple rice harvests common), it has long formed the core of the Chinese economy and provided the surpluses in food resources necessary to support growing industrial needs. This is what the great imperial armies worked to protect. The basins of the Changjiang, which link together seven provinces and two municipal-class cities, cover about 16 percent of China’s land and have 38 percent of the people. The fertile, intensively cultivated lake basins near Wuhan have been called the rice bowl of China, and agricultural productivity is immense. Population densities easily exceed 1,000 people per square mile (1,600 per square km) in places, with an urban focus on the tricity hub at Wuhan, the site of one of the newest and largest steel complexes in the country and just downstream from the massive Three Gorges Dam. The Changjiang, unlike the Huang, can be navigated as far inland as Sichuan Province, with the huge port city of Shanghai (16 million), near the river’s mouth and the largest city on the Asian continent, serving as the gateway to the nation’s heartland. It is on the Changjiang plain that the transition between northern and southern patterns of cultivation occurs (the rice-wheat boundary). Although the transition separates China’s cultivated area in half, only onethird of the total agricultural production lies north of the line. South of this division, irrigated rice fields spread out over the lowlands, and tea and other tree crops are planted in the hills. Taken as a whole, the rice-tea agriculture of southern China produces 60 percent of China’s food supply on less than half its cultivated area. It also contains a majority of the animal population: half the cattle and two-thirds of the pigs. The Sichuan (Red) Basin, some 1,000 mi (1,609 km) inland, is an ancient lake that dried up thousands of years ago and has since been filled by ages of erosion and river deposition. The basin is the core of Sichuan Province’s 84.6 million people, two-thirds of whom live in the basin proper. Terraced slopes are planted with rice in summer and wheat in winter. At higher elevations, sweet potatoes and corn are grown, with tea and mulberry trees planted on hill slopes. With 56 percent of the available land devoted to paddy rice, the region is one of the most concentrated rice-growing areas in the world. On the basin’s eastern border are the Wushan Mountains, a remarkably eroded limestone complex that presents a fascinating gateway landscape as you enter the Three Gorges (Sanxia) region of the Changjiang. Although the area’s geography is not well known, mention Hong Kong and most people would indicate some understanding. A few more would think of Hong Kong’s sister at the other end of the Pearl River, Guangzhou (old Canton), as the other major city in the area. But why? Despite China’s extensive coastline, it has few natural harbors with access to the interior. The Pearl River Delta region happens to be one of the biggest and best adapted. The region experiences three quite clearly marked seasons, and most annual rainfall falls in the long, hot summer. Temperatures are high enough throughout the year for a 12-month growing period, with rice by far the most important crop. Nearly all the rice grown is freshwater paddy and is at least double-cropped. Other important crops include sweet potatoes, corn, sugarcane, groundnuts, tea, and many other kinds of vegetables. Fruit grows in profusion in this tropical climate. Prominent are the pineapple, citrus fruits, lychee, longan, papaya, guava, banana, and persimmon. Guangdong’s silk production is considerable and ranks third behind Sichuan and Jiangsu. The Pearl River region of Guangdong Province is the heart of China’s economic resurgence, with major manufacturing centers in Guangzhou and Shenzen and outlets for international shipping through the harbor at Hong Kong. Hong Kong is also serves as the regions primary center for finance and insurance. China is the most populous country in the world, with 1.3 billion people at the end of 2002, about 22 percent of the world’s total. This figure does not include many Chinese in the Hong Kong Special Administrative Region, Taiwan Province, and Macao Special Administrative Region. It is also a multiethnic nation with 56 ethnic groups, the Han being the most numerous, about 92 percent of the population. The Han people live throughout the country, though mainly on the middle and lower reaches of the Yellow River, the Changjiang and the Pearl River valleys, and the Northeast Plain. Because the Han constitute the major population of China, the other 55 groups make up what are known as national minorities. Although fewer in number, they are also scattered over a vast area, but are mainly in the border regions from northeast to the southwest. Of these, the Zhuang people from Yunnan, Guizhou, and Guangdong are the most numerous at 15.5 million. Although the minority groups are numerous, 18 of them account for 94 percent of the minority population. Yunnan Province, home to more than 20 ethnic groups, has the greatest diversity of minority peoples of any province in China.